So, you’ve bought a fish tank or you’re thinking about buying one and you’re wondering what the 15 best tropical fish for beginners. Well, we have a great selection below for you to consider. All the fish listed below have been carefully selected for a number of reasons from hardiness, price, size and feeding habits. Because your aquarium is new and not fully established with enough natural helpful bacteria they can be prone to crashing. This means that the water qualities can change quickly and chemicals can build up in the water from fish waste and excess food and poison your fish. As time goes on your tank will become established with enough natural bacteria to cope with any slight problem. As a beginner, you will not know how to fix this problem quickly so you’ll need to have fish that are very hardy and can withstand poor water conditions for a short period and survive. 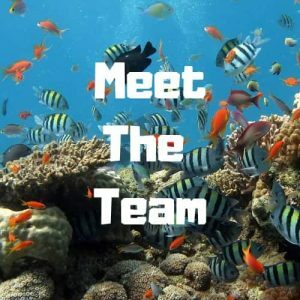 You should never have poor water conditions but as a fishkeeping beginner, you will make mistakes like the rest of us. Read our article about the 30 most common mistakes beginners make and you’ll see some of the common mistakes. It might help you avoid making some of them. 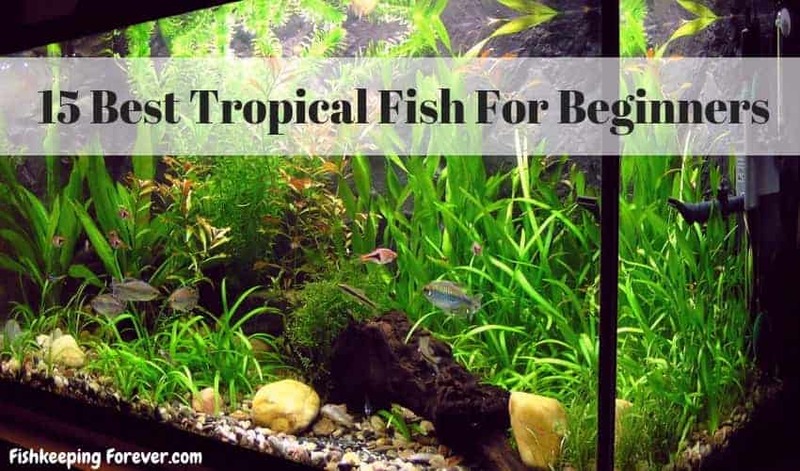 Let’s have a look at the 15 Best Tropical Fish For Beginners, You will probably have seen or heard of #14 as it’s the number one selling tropical fish in the world. The Guppy Fish (Poecilia reticulata) also referred to as million-fish or rainbow fish is known worldwide. It naturally originates from Northeast and South America but mainly bred in captivity these days. However, it is now a common household tropical fish kept by almost every aquarist as one point or another. Furthermore, due to its relative cheapness ($1-6) and ease of keeping. Moreover, they are available in a variety of vibrant colors. This lively fish is extremely easy to care for since it is pretty low maintenance and have a peaceful temperament which suits most beginners. For starters aquarists, these widely distributed tropical fish are a resilient breed in that they can adapt to a varying water condition which makes them perfect for a beginner. These omnivores are not picky eaters. They can consume most foods without any deterrent to their health. Their food can include regular fish flakes, live or frozen brine shrimp, Daphnia and blood worms. It is completely commonplace for them to even survive a week without being fed, not that we condone that but with many beginners, they often forget to feed them every day. It is an especially strong testimony to how resilient these little creatures are. They do not require frequent or large feedings due to their small stomach size once or twice a day in very small portions is best. Despite their tiny bodies, it would be advisable to keep them in a hard-water aquarium with a ten- Twenty-gallon tank as a minimum with plenty of places for them to gain sanctuary. They are extremely harmonious and mix well with other peaceful fishes. Since they breed rapidly, keep the female to male population controlled. The Molly fish (Poecilia sphenops) has another name which is Common Molly. Originally, they are from Malaysia and are popular for their passive temperament and, also high ability to adjust pretty quickly. They are available in abundance, at a very low price ($3-6) and a large color scheme to choose from. Moreover, they are playful, energetic and a good starter fish. Seeing as they grow up to only 3-5 inches you’ll only need a tank size of 20 gallons, consisting of hard, alkaline warm water. It acclimatizes gradually but eventually becomes easy to keep and not very demanding. Being hardy and less aggressive, this versatile fish is a particularly decent pick for beginners. Given their nature, it is generally wise to place any calm, tropical community tank species with them. Furthermore, place plenty of live water plants and algae to nibble on, in their well-lit tank. These fish are one of our favorites and sometimes are overlooked by many experienced aquarists which is a shame. They are also great for cleaning your tank as they love to algae and dig around in the substrate and loosen up the dirt trapped in the gravel for the filter to pick up. 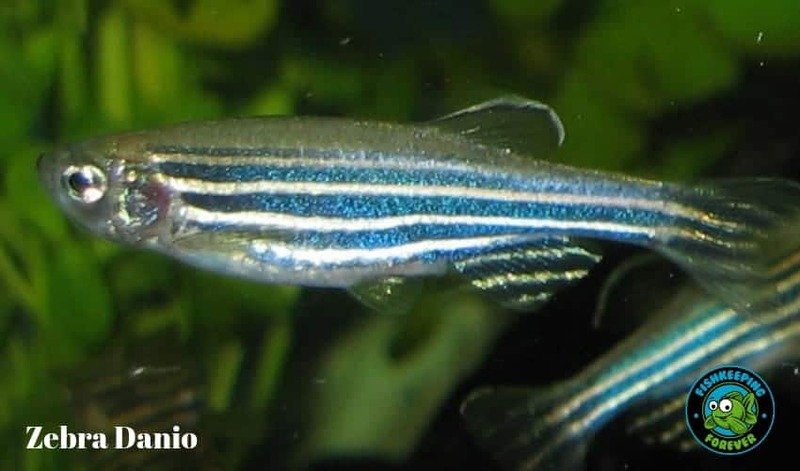 Danio rerio or the ZebraFish are native to the Ganges and the Himalayan region. They have a distinctive and easily recognizable zebra pattern. Owing to their hardiness, they are optimal for novice keepers unaware of how to set up a tank. Inexpensive at the price of $1-2 helps in making sure that they can be purchased in groups of at least five because they are schooling fish i.e. without a community they grow highly agitated and stressed. They have a natural ability to school in large numbers and look incredible in an aquascaped aquarium. Watch our video on this topic as they are highly regarded as a great schooling fish. They grow up to only 3 inches and require a 10-gallon tank and can survive in most water settings but look stunning in larger aquariums in big schools of around 20-30 fishes. Since it has a tendency to jump you’ll need to make sure your aquarium has a tight lid. Non-picky with their diet, these omnivores will eat almost anything. It can be fed a varied diet of fish flakes, worms, and frozen foods. These fish rate highly in our favorite tropical community fish of all time. The Dwarf Gourami (Trichogaster lalius) is one of the smaller species of gourami that emerged from South Asia as a peace-loving, shy fish. They are a Labyrinth Fish which means they breather directly from the air and thus required access to the surface. This breed is high in demand due to its diverse, radiant pallor available in powder blue, flame red, and rainbow patterns. They have a very low mortality rate and don’t need much help to survive up to four years or more. These easygoing omnivores can live on a meaty and algae-based diet. They are an ideal community fish because of their nonviolent demeanor and their knack at quickly acclimatizing themselves. They grow only up to 2.5 inches and need an aquarium size of 10-20 Gallons. Therefore, a dim lit tank with an abundance of rooted plants and floating plants would be fine for them. It is necessary though to regularly clean their water as they can be susceptible to various tropical fish diseases. They are tough and can tolerate both hard and soft water. 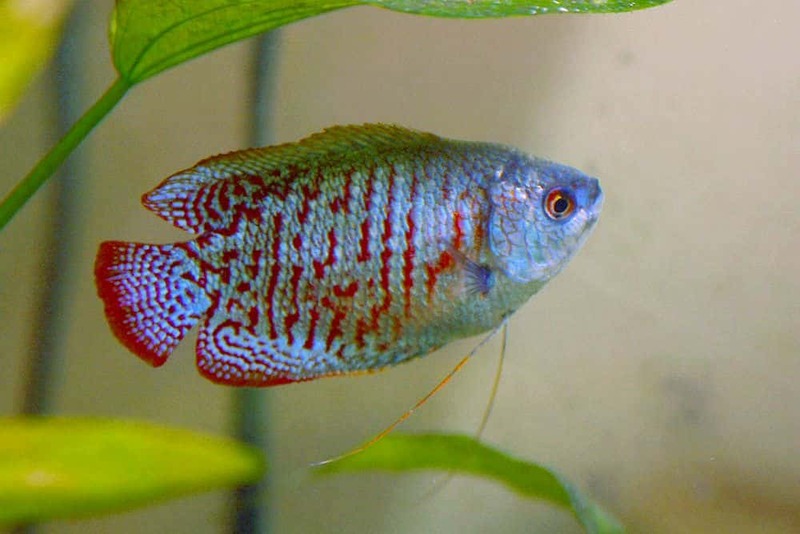 For more information read our complete guide to dwarf gouramis. Temperament Peaceful-Don’t keep 2 males together. 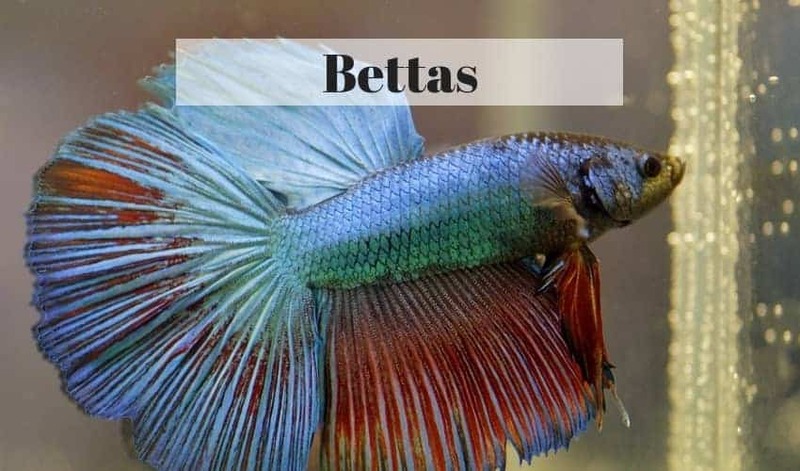 The Siamese Fighting Fish (Betta splendens) from Thailand is one of the most popular fish in the freshwater aquarium trade. The reason for this is their aesthetically appealing look. They are an extremely hardy Labyrinth Fish when kept in ideal waters although too often they are kept in very small tanks which is far from perfect. Their strong will to live is seen as they can sustain themselves in stagnant, oxygen-deficient water systems. 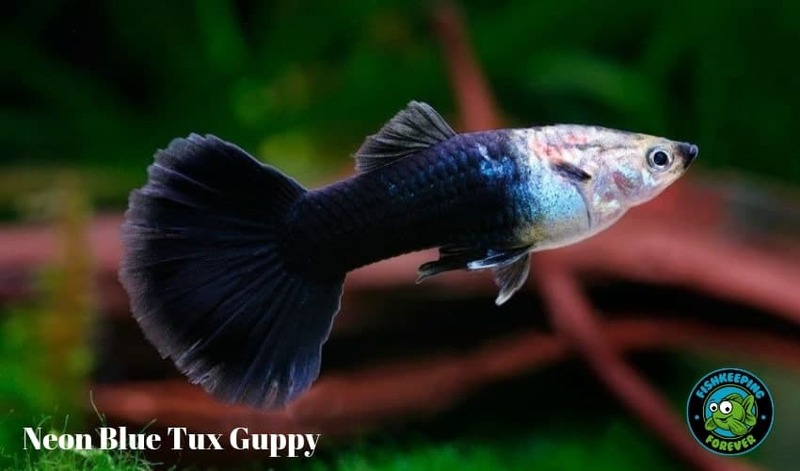 Although seemingly high maintenance, these beauties are very simple to care for and affordable at $4 however, some specially bred show fish can fetch large sums. As omnivores fish, they require both animal and plant food in the form of fish flakes or worms. Growing up to 3 inches, a suitable setup would be a well-filtered aquarium no smaller than 10 Gallons with acidic water with steady temperatures of 24-28 degrees Celsius. However, they can also endure poor water quality and even tolerate small spaces but we don’t recommend that. Hence, for a new aquarium keeping learner, they’ll be less likely to disappoint as they don’t die easy. They can be a bit nippy and you need to watch out for other inhabitants nipping their fins. Also, they are not called fighting fish for nothing. They will fight to the death if two males are kept in the same aquarium. They aren’t schooling fish and so should be kept singly. But they can live with inhabitants of other peaceful species like neons, barbs, rasboras, and mollies. 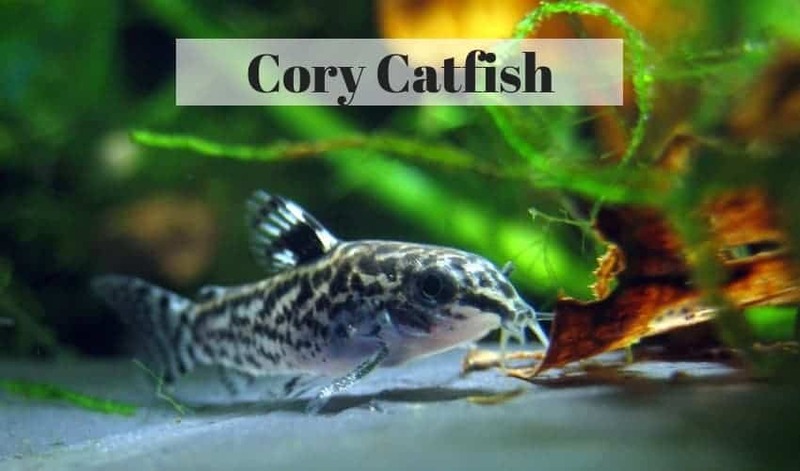 Max Size Some species can reach 9"
Catfish (Siluriformes) also recognized as Cory Cats traces back to Brazil, South America, and Upper Rio Guapore. Ample amounts are available worldwide from 140 types to choose from and at prices of merely $6 or more, making them an aquarium must have. Even as bottom-feeding catfish they possess a cool temperament and can possess a lifespan of up to twenty years. They are a very sociable species and thrive in community tanks consisting of mixed species. Because of their bubbly personalities, they’ll need a soft-bottom aquarium of 30 gallons of water, although they only develop up to 3 inches for most species. They are admirable and duty-driven when it comes to meticulous tank cleaning. They’ll pick up leftover food from the gravel all the time. Even so, their omnivorous appetite needs to be further satiated with a well-balanced diet consisting of dried, frozen live and flaked foods. Don’t overlook their dietary needs and ensure as responsible fish keepers you provide them with the best catfish food possible. We have reviewed the best to make it easier for you to provide them with a well-balanced diet. 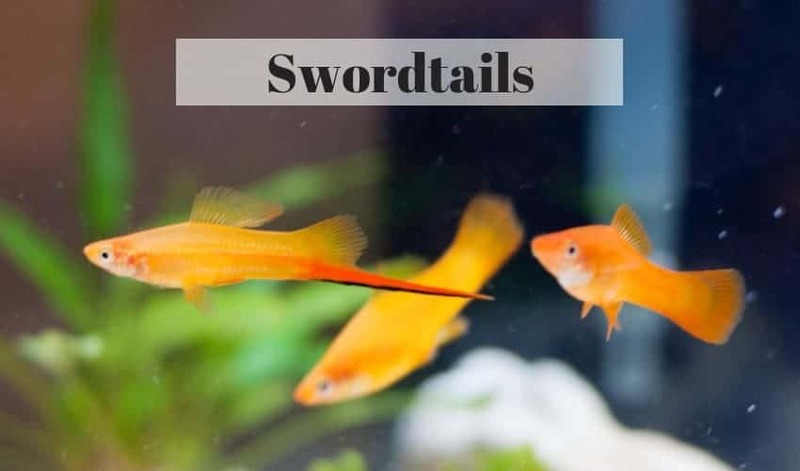 The Swordtail (Xiphophorus hellerii) can be traced back to North and Central America. They are hands down the most mainstream species to date and labeled as a “beginners only” fish which we don’t agree with. These fish are more than just a beginner fish even if they are perfectly suited for that role. At a steal of $5, this highly sought-after freshwater fish is a crowd pleaser because of their effortless care routine. With their amicable traits, they clearly belong in a community habitat but singly as they may be territorial towards other males of the same species. They normally catch the eye of hobbyists because of its unique sword-like tail and will to live. In particular, one more factor is how wonderfully varied the options are to pick from. Including Marigold, Red Velvet, Black Nubian, Pineapple etc. They can grow to around 4 inches, so they must be housed in 20 gallons of water (25-28 degrees Celsius). However, they have low demands when it comes to water conditions. Commercially processed foods will serve their omnivorous cravings. Such as vegetable-based flakes, tubifex bloodworms, brine shrimp or plant-based diets including algae. One to watch out for next time you visit your local pet store or aquarium shop. The Fire Mouth Cichlid (Thorichthys meeki) is native to Central America. It defines the epitome of beauty with their pearlescent turquoise blue body, highlighted by the red coloration of their scales. When looking to house your aquarium with some interesting and colorful fish then these are a go-to choice for newcomers to the cichlid world seeing as they are readily available and inexpensive for around $6 each. They are classified as semi-aggressive, but mainly whilst spawning in the breeding season. Otherwise, they’re generally friendly and can be kept in a freshwater aquarium with larger more active fish. If you want more than one fire mouth cichlid, make sure to buy ones that are all equal in size to minimize potential risks. Also, they grow about 6 inches. Therefore, it is advisable to keep them in at least 30 gallons of water (21-24 degrees Celsius) consisting of a fine gravel bottom for foraging in and plenty of rockwork to hide in. They love to dig and move the gravel around so ensure the decor is glued in place to avoid it crashing down on them. They are omnivorous and not particularly finicky when it comes to their diet. Regular and commonly sold foods like ocean plankton, flake food, and Cichlid pellets can be fed to them. 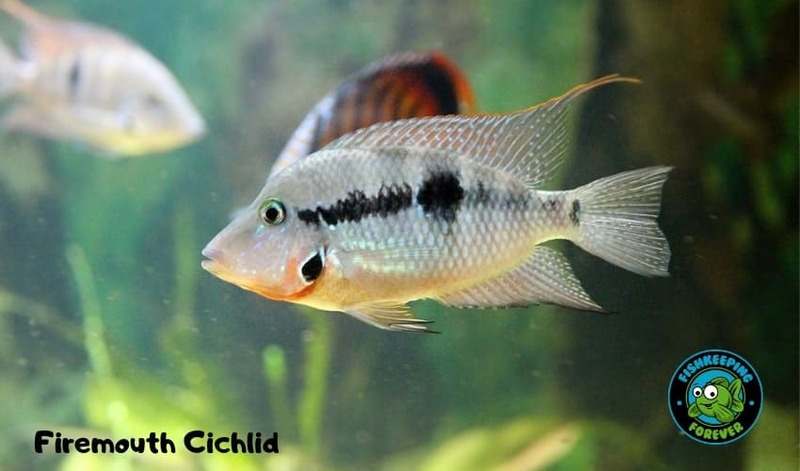 We reviewed the best cichlid for in 2018 and you can read the review and findings here. 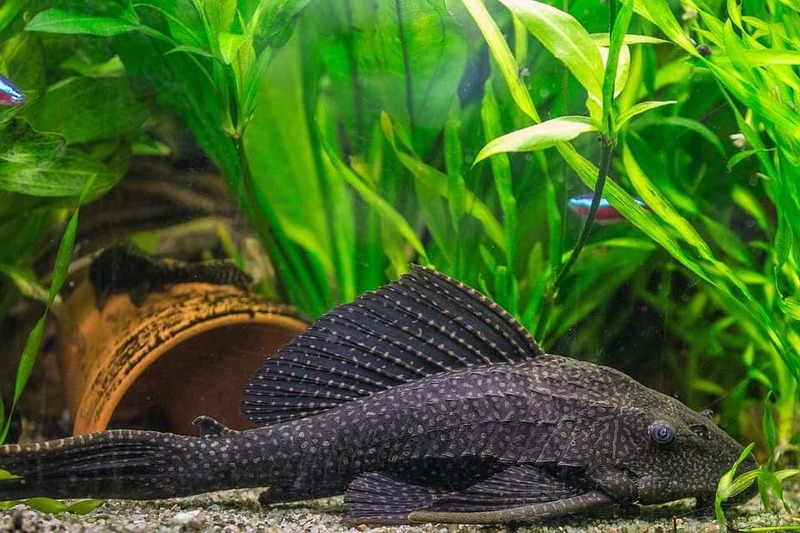 The Suckermouth Catfish (Hypostomus plecostomus) or common pleco, is a tropical fish that most people will have seen before. To begin with, this fish ranges back to Tropical Northeastern South America (Amazon region). Moreover, it is identified by the heavy armored plates on its body. They have a very universally high demand in the aquatic trade. The reason is their long-life expectancy of up to twenty years, the economic cost of $4 and tranquil temperament. They can exist with many different species. However, they don’t stay that cute little fish for long. They grow huge and nearly always outgrow most people aquariums within 5 years. Many people think these fish can just live on algae that grows in your aquarium and some leftover bits of food that sink to the bottom but this isn’t the case. We like to feed ours sinking catfish pellets. They need the correct nutritious diet that all fish need. So ensure you provide them with a varied and stable diet. Read our complete care guide for keeping Plecostmus catfish. Cost From $8 for a small 3”- $50 for an adult. 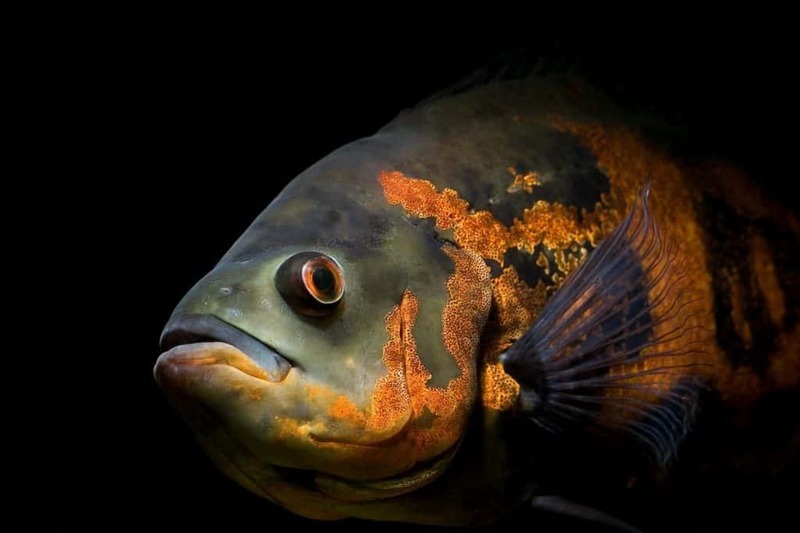 The Oscar (Astronotus ocellatus) also recognized as marble cichlid or velvet cichlid hails from South America. Tagging along are a fair bit of requirements for keeping this fish. However, the reason why it should be on a tropical fish beginners’ list is that of how exceptionally intelligent and playful these organisms are. To the point that they can also be trained to follow commands and, also do tricks. They are classed as semi-aggressive and are better, therefore, be kept in a tank of their own (non-community-oriented species), but they do flourish in pairs. If kept with other fish they will need to be of similar size and aggressive nature. Unbeknownst to many buyers, these 1-2-inch baby fish tend to grow to monumental sizes of 12-14 inches in a very short span of time. As such optimally, they require a 70-100-gallon tank with deep gravel bottoms and plenty of large heavy rocks. With their high-water hardness levels can bear basic aqua systems. Efficient water maintenance and filtration system will be handy seeing as they produce a lot of waste. You will need to perform regular water changes of around 25% each week to remove the excess waste and leftover food. The best part, you can hand feed these carnivores and their voracious appetites with ocean plankton, small fish, bloodworms, flakes, tetra cichlid crisps, and earthworms. They are so much fun to keep but remember you will need to house them in a large aquarium with good filtration. Read our complete guide to keeping oscar fish. The Red Tail Shark costing (Epalzeorhynhos bicolor) is endemic to Thailand. This stunning fish is the proud owner of a jet-black body and a bright red tail. This would make any aquarist want to have in their aquarium nethermind that it’s a shark!. Also, they have a growth capacity of 6-7 inches on average but have been known from time to time to reach 8″ and lifetime expectation of 5-6 years. Therefore, you will need a tropical freshwater 55 gallon, equipped with a weighted lid to prevent escape. You can also decorate it with caves, plants, dense vegetation, and fast-paced water flow. They do however have a reputation for semi-aggressive behavior because of their territorial tendencies. One can keep them in a community environment with Angelfish, Danios etc. Do not place other red tail sharks if you are a beginner as it is unrealistic to think that it will be manageable, so singly placing them would be better. They are often confused with rainbow sharks which look similar. 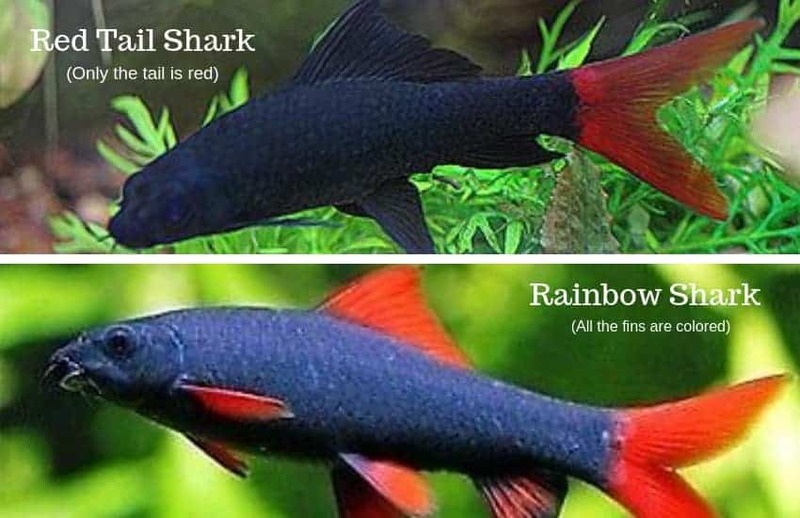 You can see the difference here in our rainbow shark complete care guide. This non-fussy omnivore will most likely consume algae, plants, insects, flakes, pellets, krill, even cucumber, fruit. You can spend hours watching this lively swimmer from day one as they acclimatize quickly. They are sometimes confused with Rainbow sharks due to their similar appearance. See the image above. The Harlequin Rasbora (Trignostigma heteromorpha) is a native of Singapore, southern Thailand, Malaysia, and Sumatra. It is definitely a favorite of fish keepers with its beautiful metallic color of reddish copper. Also, one can buy it at the low price of $2 which makes it an excellent freshwater fish for beginners. Especially when they’re livening up the aquarium with a burst of color and flurry of activity. Sizing up to 2 inches, it can easily live in a small 10 gallon, established planted aquarium in waters of around 22-23 degrees Celsius, with soft, acidic water, subdued lighting, and dense vegetation. Since it’s schooling, community fish. Thereby, it should be purchased in groups of 8-10 individuals matching its peace-loving temperament like betas, cory catfish, neon tetras etc. 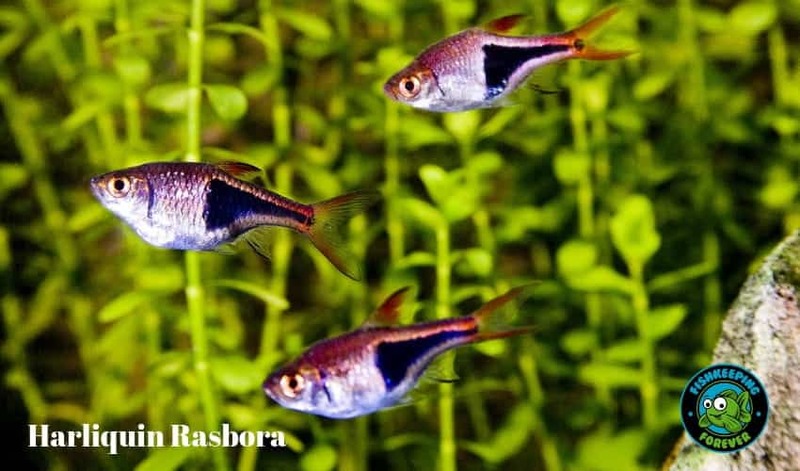 Read our article entitled Top 9 Freshwater fish for a new aquarium to see suitable tank mates for this lovely rasbora. Moreover, easy going eating attributes means they can be fed flake food, tubifex, and freeze-dried bloodworms. These fish are underrated in our opinion and look incredible in a large aquarium, well planted in larger schools of around 20-30 fish. Simply stunning! True Loaches (Cobitidae) usually come from Morocco and Eurasia. They have a low $3 price tag for a small loach like a Kuhli Loach to $80 for a fully grown clown loach. What makes them a good pick for fish keepers is their incomparably friendly personalities. Since there’s a lot of interaction between the other fish when feeding which can be very entertaining to watch. As a proficient acclimatizer, this 4-inch fish on average can live in an average aquarium with 50 gallons of water (26-30 degrees Celsius) that is very clean, well oxygenated, with moderate flow, fine gravel, hollow logs and caves, driftwood and plant roots. But don’t be fooled some loaches can grow to 15″ and need a much larger aquarium. Characteristically affable, they can inhabit community tanks with no signs of imminent danger to other species placed with them and preferably should be bought in a group of 5-6. They are carnivores that will require cyanobacteria, tubifex, live foods, occasionally flake foods and freeze-dried bloodworms. 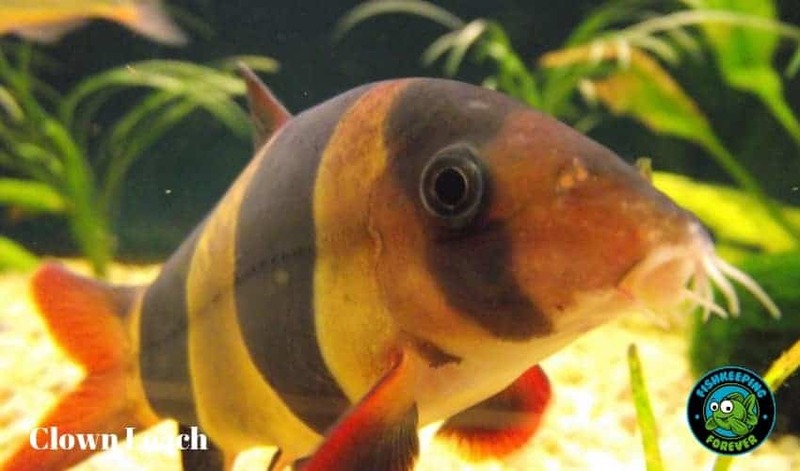 Most loaches spend their whole lives on the bottom of the aquarium digging in and around the gravel looking for food. This offers a different viewing level within your aquarium. A perfect combination would be to have some bottom feeders like catfish and loach, mid-level fish like neons and mollies and a few surface swimmers like dwarf gouramis. The Neon Tetra (Paracheirodon innesi) is native to the Orinoco and the Amazon Basin of South America. 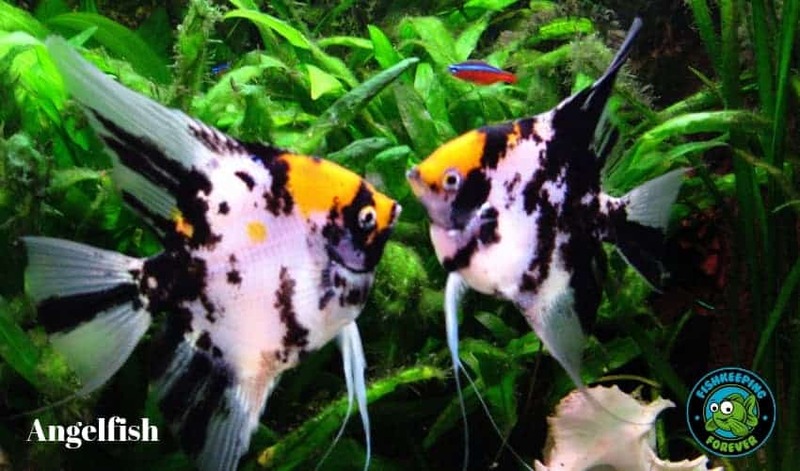 They have rightly earned the title of the best-loved tropical fish. Around two million of these are sold in America each month and the reason is not just that their dazzling bodies look great but actually their unmatchable temperament is the key selling point. The most desirable ambiance for them would be 10 gallons of water as a minimum. Stable table water parameters, low lighting, dense plantation, soft water, low watt fluorescent lighting and regular sponge filter in a matured, established tank are ideal. Even though sheltered environments are there go-to, yet they are completely community-oriented tank-mates. Moreover, they can reside amongst other species like cory catfish, barbs, guppies etc. It is best to buy them in groups of around 10-15 because as a general rule this assists in the adjustment and establishment into their new home. They are also natural schooling fish if you’re not sure what schooling fish then take a look at our article on the topic. Both, in the wild and in the home aquarium they portray omnivorous qualities making them unchallenging to feed. Incorporate within their diets larvae from insects, brine shrimp, algae, nano vertebrates, tubifex etc. They have a fairly laid-back nourishment regime in that they only need to be fed once or twice a day, so they don’t pose as burdensome responsibilities. They even live up to 8 years without much effort. Plus the fact that you can buy 6 for around $20 makes them the perfect tropical fish for beginners. 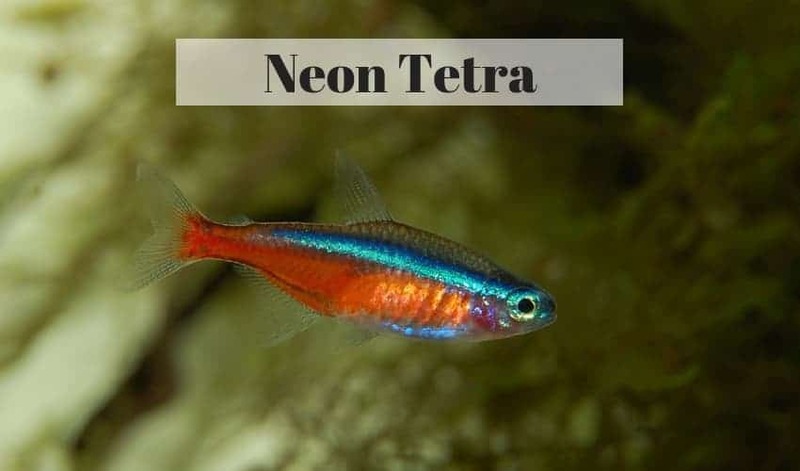 For more in-depth information on Neon Tetras please visit our complete guide to keeping neon tetras. The Angel Fish (Pterophyllum) hails from the Amazon Basin, Tropical South America, and Orinoco Basin. They are recognized as a standard tropical fish for every aquarist to own. These graceful fish grow up to 8 inches and can be appreciated in a varied range of shades and patterns. They are very hardy and easy going but can be semi-aggressive from time to time. They will need a tank of 55 gallons of water as a minimum, moderate current flows, floating, driftwood, and broadleaf plants. They do, however, prefer slow-moving water with dim lighting and downed branches, as is in the wild. It is possible to place them with larger tetras, rainbowfish, catfish etc. Catering to their semi-aggressive temperament they should be kept singly or in a large school which diminishes their aggression. Their nutrition requirements are that of an omnivore (2-3 times a day) including worm, small crustaceans, shrimp pellets, marine algae, frozen live foods etc. They have amazing fins and as such, you’d think they appreciate other fishes fins but no, they may nip others and damage their fins which is a little ironic. We hope that you have seen some fish in this article that attracts you to starting your own aquarium. We think most of these fish are suitable for a fishkeeping beginner although they are not all suitable to be kept in the same aquarium. You definitely don’t want to keep Oscar fish with Neons for example. In their own right, they are all amazing fish and will help you enjoy and be successful in starting and maintaining your first aquarium. We have a complete guide for you to read which we think will help you make some of the basic decisions when it comes to setting up and stocking your first aquarium. Good luck and we hope you enjoy your new aquarium. Please visit and subscribe to our Youtube channel to see some helpful videos and fun fish stuff.